A piece of controversial public art at the corner of 33rd and Avenue C was removed yesterday. Tarped-over public art at the corner of 33rd Street and Avenue C. (Courtesy of Luke Coupal)​Found Compressions One and Two, by Saskatoon artist Keeley Haftner, was made out of two bales of recyclable materials wrapped in cellophane. 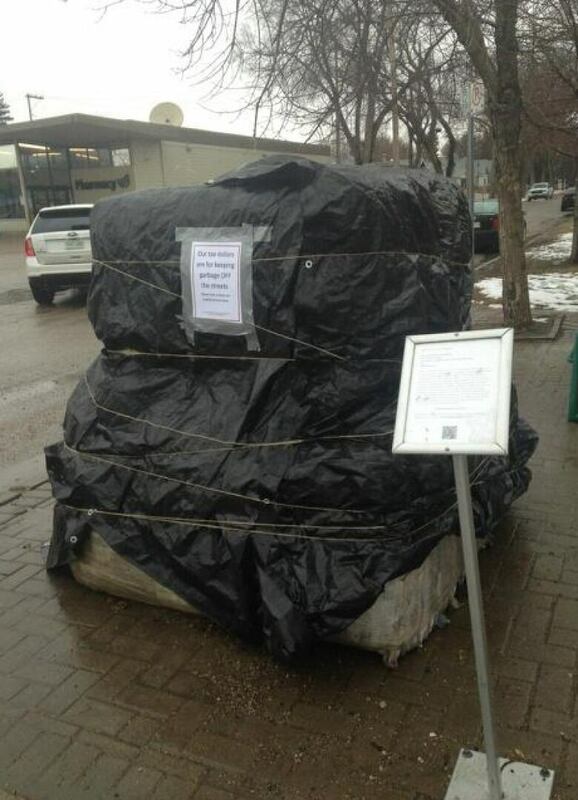 The artwork made headlines when a local resident wrapped the public art in a black tarp because he disliked it. 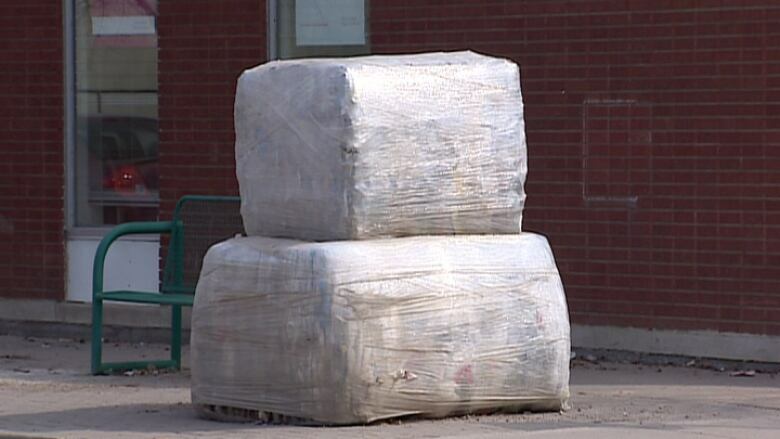 "It's literally two compressed bales of garbage," Luke Coupal said last week after he covered the artwork in a tarp. Haftner agreed with the city's removal of her work of art, which has been on display for seven months, because it's breaking down and has realized its full potential in creating a dialogue. She said the work wasn't intended to be a long-term piece of public art and was surprised that it lasted as long as it did. "It's at a point where its life is over regardless of the controversy and where it was set," she said. "To leave it in place for a significantly longer period of time would just to be promote antagonism for the community of Mayfair without sort of respecting their wants and also without garnering any more useful discussion." The artwork was part of the city's Placemaker Program, which promotes contemporary art in public spaces and leases art from artists. Haftner plans to take the material and create a new work that isn't in the same form, but hopes it will continue the discussion. "I think it's a really great learning experience all-around," she said. "I think it's provoked some really great discussion on value and ideas of public art within the city. So for that, it's a success."